This will be a complete walkthrough to setup up certificate based on a CA server on a DC. 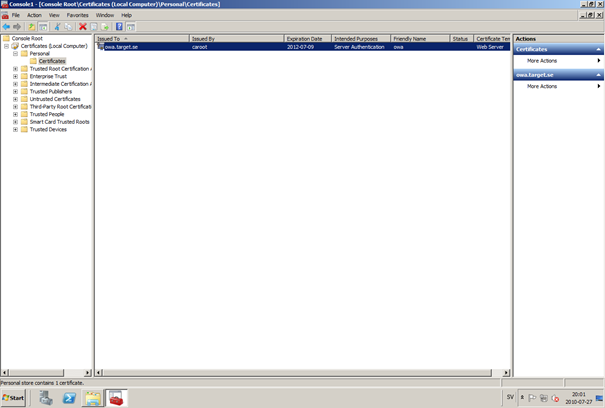 Everything is running as virtual machines in VMware Workstation. Just to get the name resolution working fine with the rule and certificate. First thing to do is to import the certificate that is generated from the CAS server; in my case it’s a CA server on the DC that generated this certificate. Best practice is to buy the certificate from a 3rd part that is trusted root in most devices (godaddy.com, digicert.com, comodo.com, verisign.com etc). 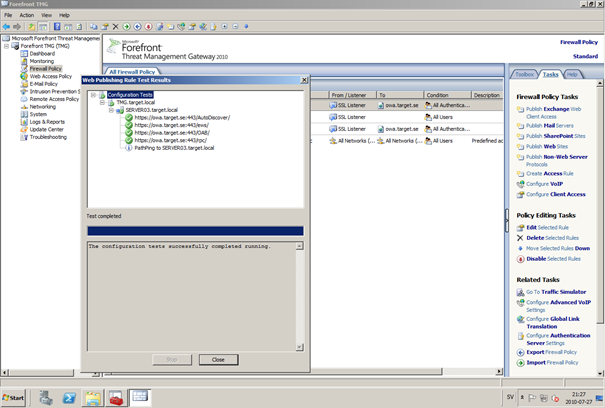 The certificate import is easy, start a mmc console and add certificates for the local computer. Go to Personal and right click, choose import and point at the file. When it’s done it should look like below. Next step is to create the Web listener, it will be done in TMG Console under Firewall Policy, choose Toolbox and right click Web Listeners to create a new web listener. Give it a friendly name, I called it “SSL Listener”, set it up to require SSL, select the sources where it should listen to traffic from. 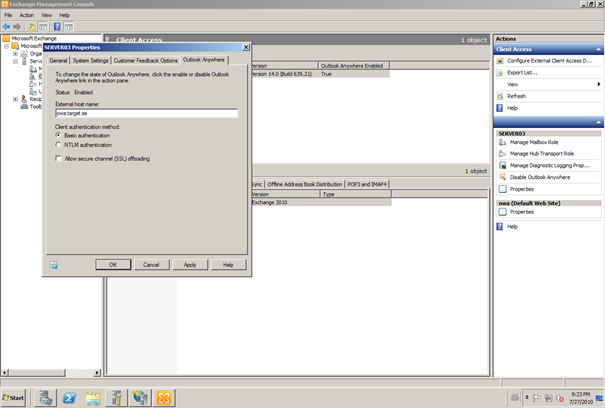 In my case I listen on External and Internal, also select a specific IP address on the External and Internal interface. 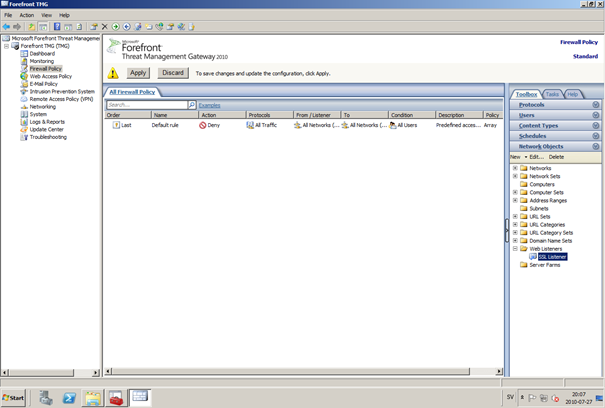 Next screen select ‘Assign a certificate for each IP address and point out the imported certificate. The authentication setting that will be used is called HTML Form Authentication, make sure that Windows (Active Directory) is selected. In the SSO (Single Sign On) type in the .domain.local if you want to use the function. When the creating is completed it should look like below. Don’t forget to apply the changes. Next step is to create the publishing rule; it will be done under the Tasks tab called ‘Publish Exchange Web Client Access’. A wizard will start, setup a friendly name like OWA (Basic) and select the appropriate Exchange version, in my case it’s Exchange 2010. 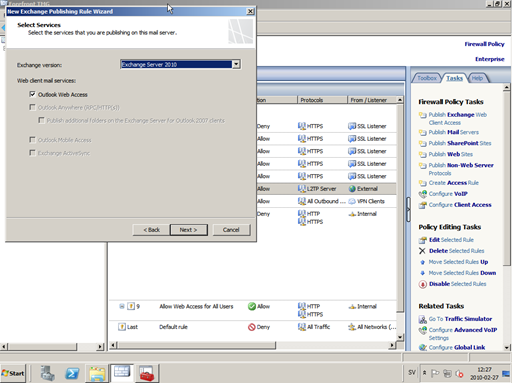 Select the option ‘publishes single server’ and require SSL. In the setting regarding internal site name, give it the external site name (owa.target.se) and select the option below and browse for the CAS server. In the public name, give it your external site name (owa.target.se). Next thing it to select the newly created web listener, for authentication delegation settings; select Basic Authentication and finally All Authenticated Users. A nice one to complete the publishing of the OWA is to create a ‘Publish Web Sites’ rule and set it to deny, publish it as a single server and require SSL. Point out the internal site name to be the external site name (owa.target.se) and browse for the CAS server. In the path selection just type / as will indicate the whole site. For the public name, type in the external site name (in my case; owa.target.se) to work. Select the web listener and the authentication method should be set to ‘No delegation, and client cannot authenticate directly’. Remove the All Authenticated Users and replace it with All Users. Open up the rule after it is created, go to the Action tab and select the option ‘Redirect HTTP requests to this web page’ and type in ‘https://owa.target.se/owa’. 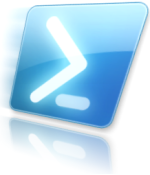 This rule is created so the end-user can reach the OWA without typing in /owa in the addressbar. Now this is completed and should look like below. 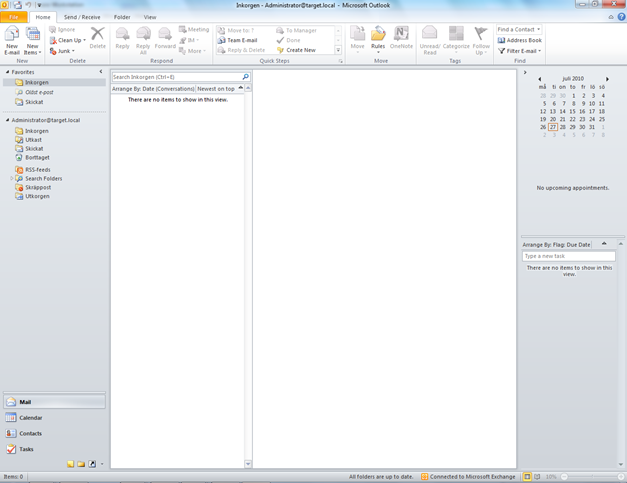 Next to do is to publish Outlook Anywhere, it will be done thru the same wizard. Just like the publishing rule above this is a single server publishing rule and it requires SSL. And point out the internal site name like before, it should be the external site name (owa.target.se) and browse for the CAS server. The public name should be the external site name (owa.target.se). Then select the web listener that has been created earlier. Basic authentication is used as the authentication method. 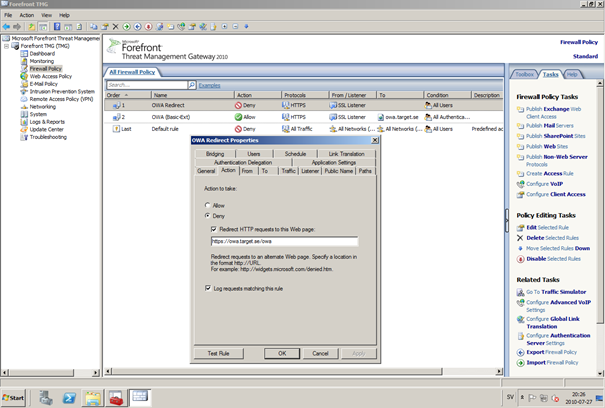 Verify that the correct authentication method is selected in Exchange Management Console (EMC), if using Basic it should look like this. It should then look like below, if you have any issues it will give you the info in clear text like authentication methods is not correctly configured, like a mismatch. Time for verification so the publishing rule works for Basic Auth by using Outlook Anywhere function and typing in address: owa.target.se that points to TMG. This is almost the same as above, besides ActiveSync will use Basic as the Authentication method. So the next to do is to publish the ActiveSync function, it will be done thru the same wizard. 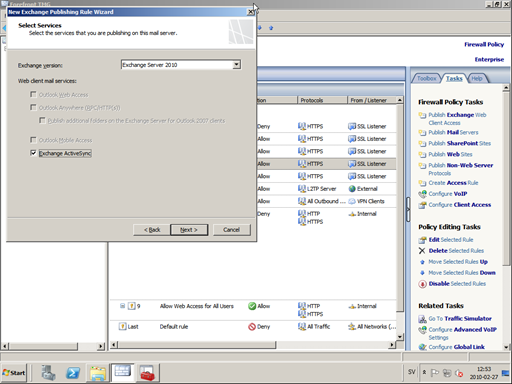 Select the appropriate Exchange version and the function you want to publish, in this case it’s the ActiveSync function. And point out the internal site name like before, it should be the external site name (webmail.testlabs.se) and browse for the CAS server. The public name should be the external site name (webmail.testlabs.se). Basic is used as the authentication method. Sometimes in testing purposes you need to turn of spoof detection, or else it will not work. It’s ok but you loose forms based authentication in OWA Virtual Directory… Do you know a valid workaround to authenticate against TMG with owa Virtual Dir with forms and auth ActiveSync and EWS with basic or integrated with the same and unique public IP Address? The only workaround i’ve thinking was drop Auth rules in Web listener and create a new HTTPS Protocol without HTTPS Decoder checked and sent the SSL traffic directly to TMG. I really appreciate this input and thorough work done. I have followed to the letter the instructions above my OWA for instance is neither working inside the lan nor extenally. internal — i get the log in screen atleast — but once i put the username and password: i get the error “page cannot be displayed”. i have never been this humbled by a new technology but TMG 2010 has proven quite a test of all in my life and career. let me suprise you further — i have also published FE smtp outbound and inbound through the TMG and guess what ! — it strips all my attachments and will not deliver inbound attachments but external go! so am forced to publish it to an isa 2006 that is what we are trying to migrate from! 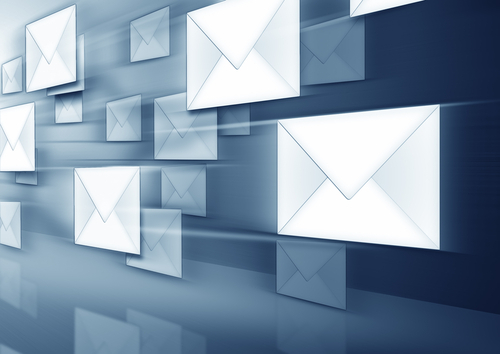 let’s start of with mail flow (smtp) inbound — why is it stripping and or refusing to deliver attachment loaded emails? two: what’s wrong with my owa publishing if i promise that i have followed tothe letter your instructions in this page. 4. pathping to FE.domain.com — good! Send me a private mail with details about your setup and infrastructure so I can assist you. Thanks for this information, it helped me diagnose a problem, i had to enable basic auth on the owa/ecp/eas virtual directories in EMC to make it work. Really useful stuff thanks again. I have a TMG ( 2 Nic ) in DMZ and exchange 2010 in LAN. All internal client are set to Outlook Anywhere to external domain name. outllook.external.com somehow all users are not connecting to exchange via tcp/ip and going out and coming back? So what can i do to fix? Have this set up with my Exchange 2003 and a Cisco ASA 5510 front end firewall. Traffic looks to be passing but all my smartphones are saying they can not access Exchange? I would start with checking the DNS entries together with the connection flow. 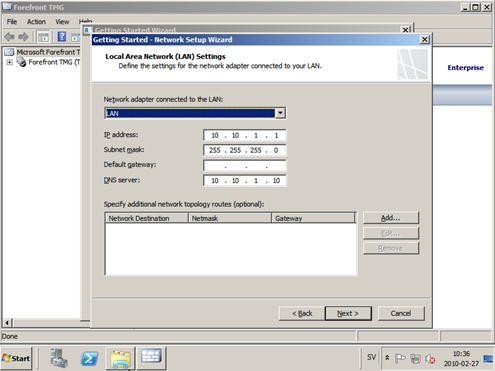 It’s now recommended do have split-dns, for having better control over such connection flow. This is good. Thanks for making it clear. How many IPs did you use? and How many certificates? Is it same listener binded to three certificates? I’ll be sure to bookmark it and return to read more of your useful info. Thanks for the post. I will definitely return. In the SSO (Single Sign On),I typed in the .domain.local. But I still need to logon two times for using the OWA. I have two CAS/HUB/MBX roles Exchange Server .